Today is Sunday. It’s raining. I slept in. I cooked all morning, barefoot in my kitchen, to the sound of Patty Griffin and window raindrops. I never put on pants. And I just poured myself another strong cup of coffee spiked with something stronger. My house smells of braised pork shoulder. And there’s a bottle of champagne on standby. It was the perfect day to execute this dessert I’ve had sitting inside my brain for over a week. 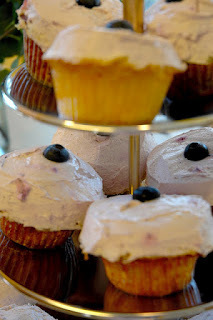 Baking on a chilly rainy Sunday is just perfection, isn’t it? 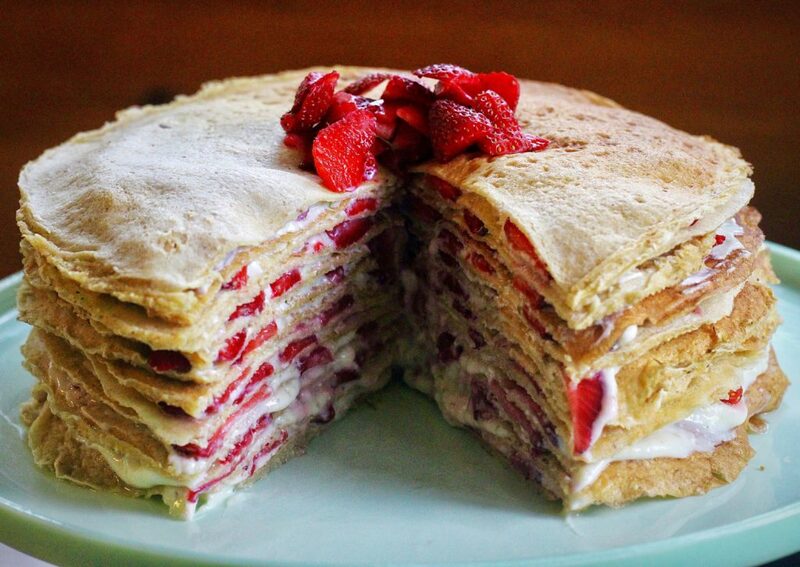 So this is a Crepe Cake. 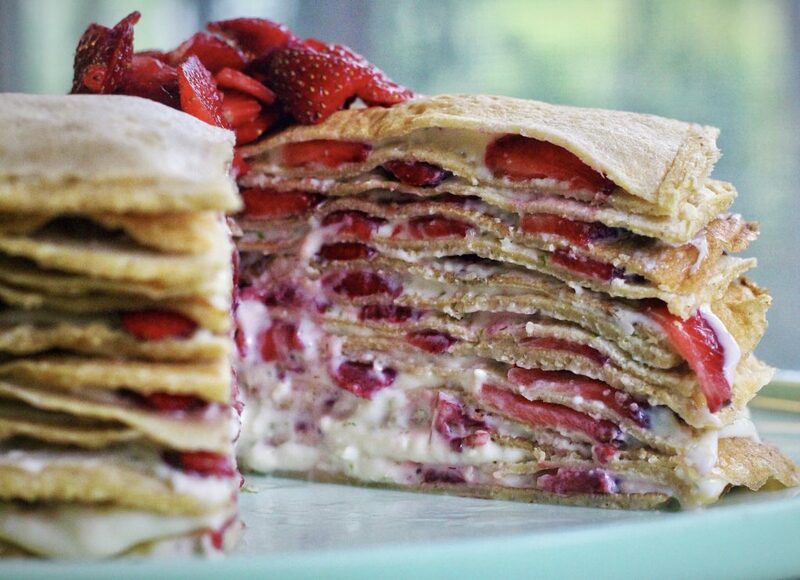 It’s just crepes layered with the filling you’d normally have folded inside. 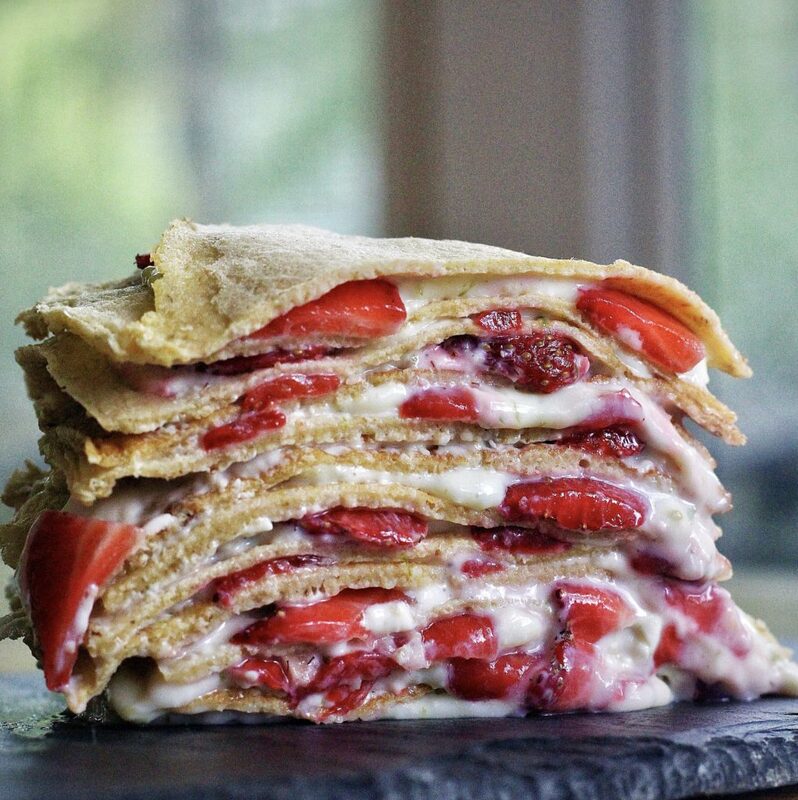 It’s incredibly easy, although yes…a bit time consuming because you’re making each crepe at a time and then layering them with hand-sliced strawberries, but honestly? I loved every minute of it. I had nowhere to be but there. I just settled into the sweet rhythm of the morning and let it whisk me away. My kids were crafting at the kitchen table, I sang along to Rain and Forgiveness and Let Him Fly and slowly this cake come together before me. I opted to make this cake gluten free, just because I know so many of you request such things. I used oats that I turned into a flour instead of wheat for the crepes and they came out so well!! The kids and I sampled them as I was cooking them up and they agreed. 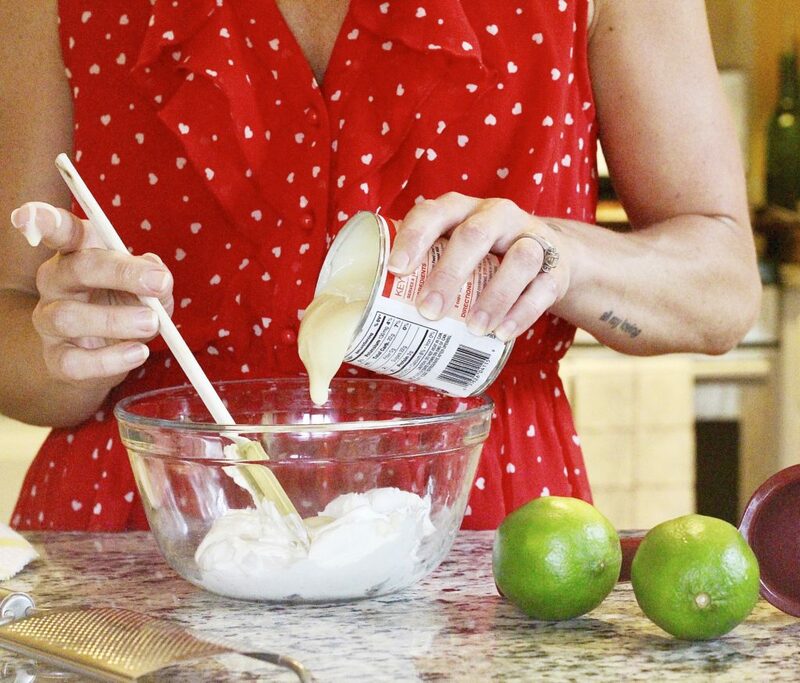 The filling is embarrassingly easy and uses one of my favorite pantry staples… sweetened condensed milk. I just love that stuff and I don’t care one bit that it came from a can. So it’s just the milk mixed with cream cheese and a ton of lime. That’s it. It tastes like key lime cheesecake and it is heaven. Then it’s all layered with local strawberries from Barbee Farms via my Farmers Market. This dessert has such a wonderful combination of flavors and textures, and I’m really so very pleased with it. It’s a little bit rustic French… a little bit tropical… so my husband likes to call it The Crepe Escape. But you can call it what you wish. Next time you find yourself on a free and lazy rainy Sunday, I highly suggest you give it a whirl.
. l i m e f i l l i n g .
Use an electric beater or hand whisk until smooth and creamy.
. o a t c r e p e s .
Blend, slowly at first, until you have a smooth batter. It will be very thin. Preheat a 10 inch nonstick skillet on medium heat. Once it’s up to temp, pour in 1/4 cup of batter (for 1 crepe) and swirl the pan as you do in order to coat the surface with batter. It takes a bit of practice, but after the first few, you’ll get it down. Adjust the heat if necessary as you go. Once the edges have curled up and tiny bubbles have popped on the surface, carefully flip and allow the other side to cook for about 30 seconds. Continue until all batter is gone, stacking the finished crepes upon each other as they finish… you will get around 15 crepes.
. a s s e m b l y . Place one crepe down on your cake pan. Slather a very thin layer of your (softened and room temperature) filling over the crepe. 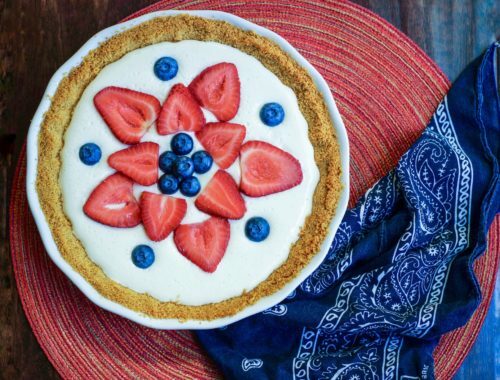 Place thinly sliced strawberries over the filling- no need to cover it completely with berries. Top with more berries if you’d like. Oh, my goodness. The perfect St. George’s Day indulgence. 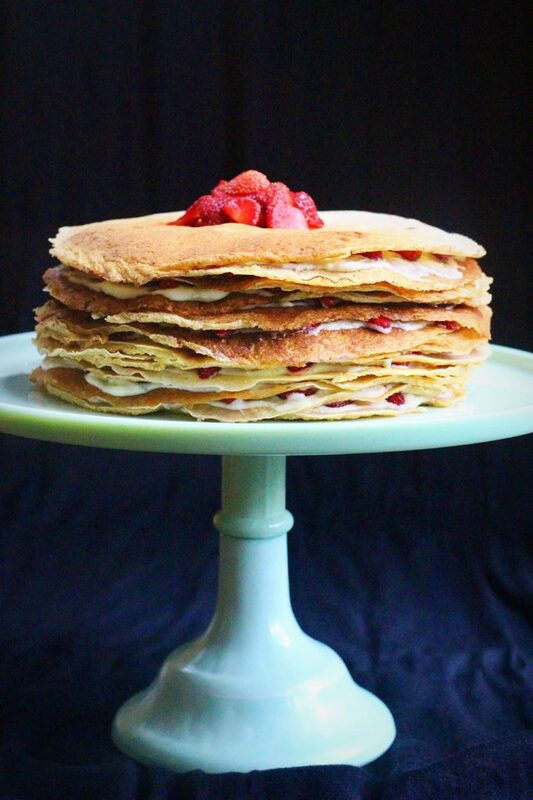 And everything about this recipe is genius: the oat flour via your food processor; the instant cheesecake via sweetened condensed milk, cream cheese, and citrus; and especially the crepe-stack and strawberries cake. Let’s call it breakfast for a crowd, easier than serving a roomful of individual strawberry crepes. I’ve thought this before, Abbey: you (and authors of my all-time favorite cookbooks like Ina Garten and Leah Chase and Russo & Lukins) think and cook like a caterer rather than a chef. So many clever tricks.